Path lighting is used to enhance dynamic landscaping elements such as flower beds, shrubbery and borders while safely illuminating pathways. CREATING THIS EFFECT: Path lights are staggered around the walkway to create pools of light that illuminate a safe passage to the home’s entrance. Grazing emphasizes a textured surface (such as a tree trunk, a stone wall, climbing ivy, etc.) by placing a landscape light source within one foot of that surface and aiming the light beam parallel to that surface. CREATING THIS EFFECT: Spot lights are placed beneath each stone pillar to create dimension, complementing the home’s entryway. 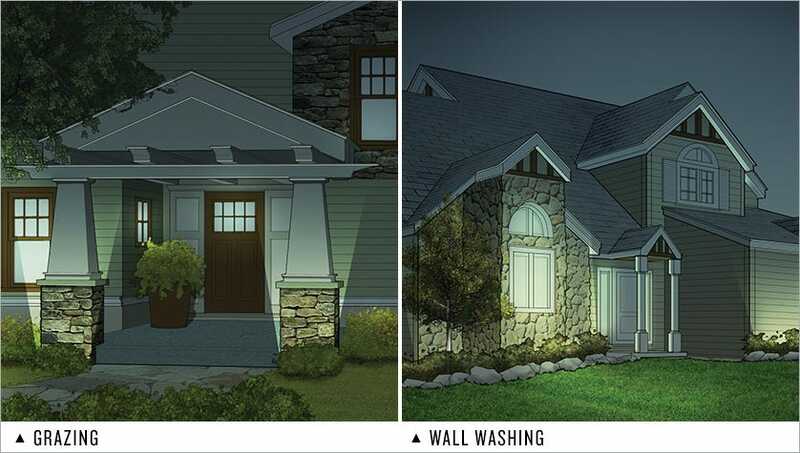 Wall washing is a landscape lighting technique that refers to the general illumination of a wall or surface. CREATING THIS EFFECT: Spot lights are placed along the front of the home to create a soft wash of light. Shadowing is an effect created by placing a landscape light source in front of an object and projecting a shadow onto a surface behind the object. CREATING THIS EFFECT: Spot lights are placed directly in front of the tall bushes, producing shadows which are projected on the home’s face, creating an interesting and inviting façade. Uplighting is a landscape lighting technique that illuminates an area, surface or object from below to create a focal point in the landscape. 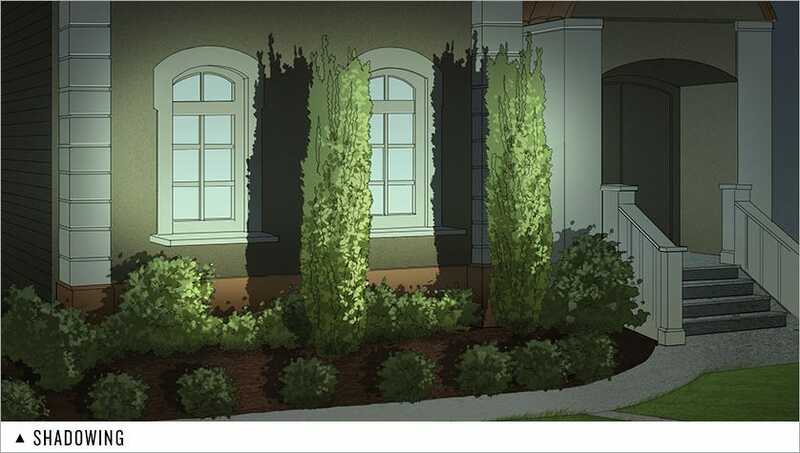 CREATING THIS EFFECT: A spot light is aimed at the tree in the foreground while the front of the home remains relatively dark. Also called backlighting, silhouetting is a landscape lighting technique used to dramatize an interesting shaped object. 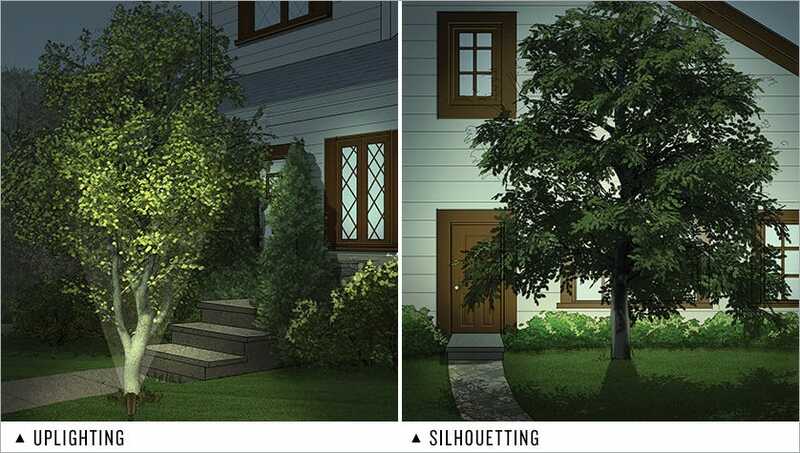 CREATING THIS EFFECT: A spot light is placed between the tree and the front of the home. The spot light is aimed at the front of the home creating a dramatic silhouette of the tree. Step and brick lights can be used in masonry and wood constructions. These landscape lighting fixtures are designed to safely illuminate stairways and walkways. CREATING THIS EFFECT: The steps are gently illuminated leading up to the doorway to ensure safely. 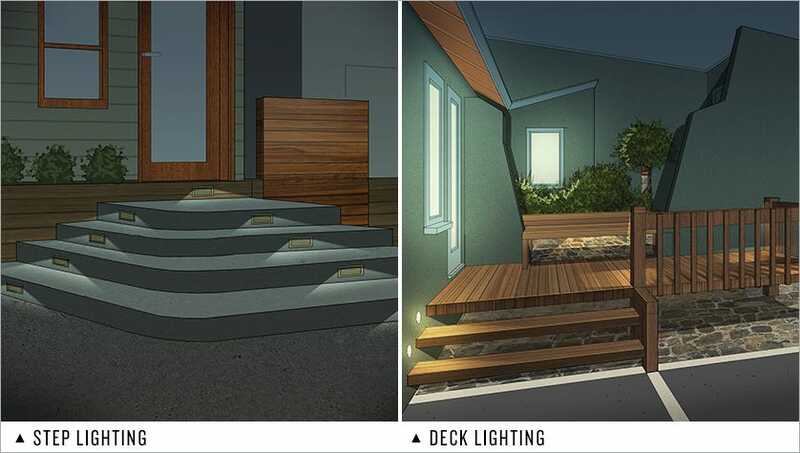 STRIDE RIGHT: Reduce the danger potential around your household by adding LED step lights to illuminate multi-level decks, entry steps, patios and wheel chair ramps. 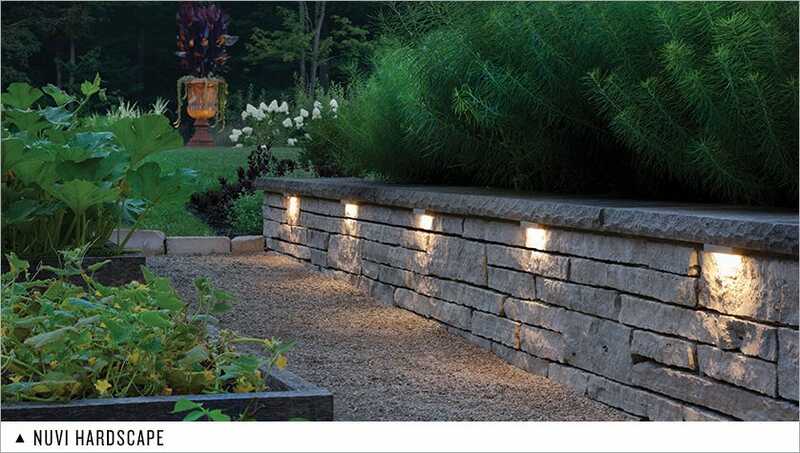 Step, brick and hardscape lighting can be used in masonry and wood constructions. These fixtures are specifically designed to provide safety and accent lighting while creating a warm atmosphere. CREATING THIS EFFECT: A surface mounted deck sconce is placed on the wall above each step to illuminate a safe entryway to the deck. 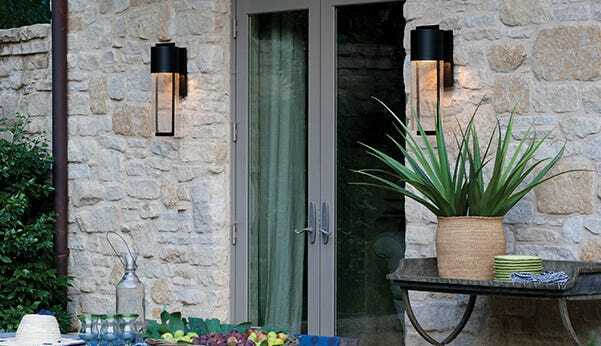 A hardscape fixture under the bench, coupled with deck sconces mounted to the corner posts create a soft glow. 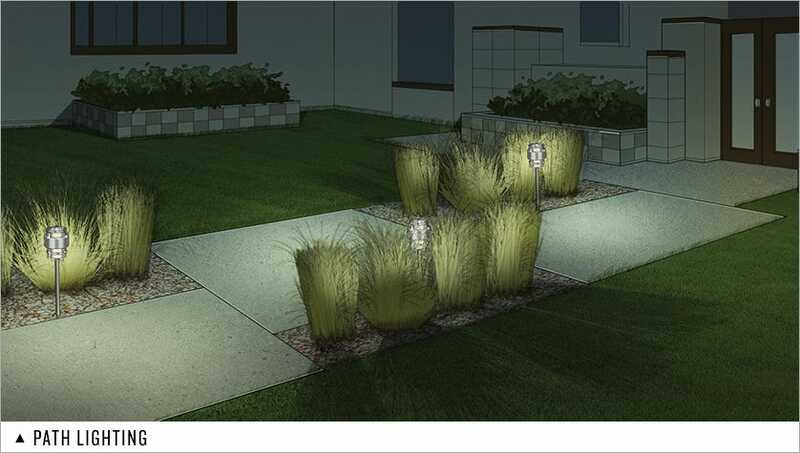 Nuvi landscape fixtures feature exceptional dimmable horizontal illumination, perfect for diverse mounting applications. Available in three finishes, its solid vinyl alloy construction is suitable for harsh environments as well.